JANUARY 2008 -- On Saturday, November 24, the Membership Committee met. A year ago, we had offered to help any Grange that was having membership problems. No Grange asked for help. However, three Granges handed in their Charters. Other Granges have very low membership. On the other hand, several Granges are doing well. We discussed the situation and decided we should contact the Granges that seem to need help and have a committee member meet with them and show possible ways to increase membership. All types of fraternal groups, church groups, women’s clubs, and similar groups are facing membership problems. If the problems are ignored or if they are used as examples as why a Grange can just fold, the Grange will fold. Sometimes a Grange will hand in its Charter and join en masse with a neighboring Grange. Guilford did that when they joined Totoket. Our officers are drawn from both groups. We have become an even more respected group in our communities. We still are working to increase our membership. We have added some excellent new members but aren’t ready to stop there. Publicity is important. Most communities have newspapers that will cover such groups as the Grange IF the group is careful to meet deadlines and format. We will be in touch with Granges but we would like to have you get in touch with us as well. 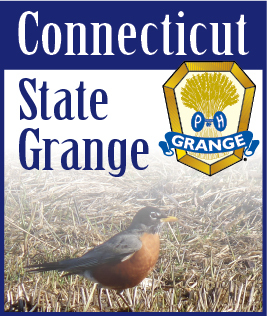 Committee members are Director Joanne Cipriano, Waterbury, 203-754-5863; Cynthia Charbonneau, Meriden, 203-237-4617; Marion Bradley, North Branford, 203-484-9948; Ted Beebe, Lebanon and Carl Manning, Higganum Grange, 860-526-3637, Chester.